AMD is all set to unveil a whole new chip named Hondo. The new chip with extremely low power requirements is still under development and has been designed to work specifically in tablet like devices. To be unveiled at around the same time the Windows 8 OS gets ready, the new chip will feature a dual-core processor having a clock speed of 1 GHz and a TDP of less than 4.5. 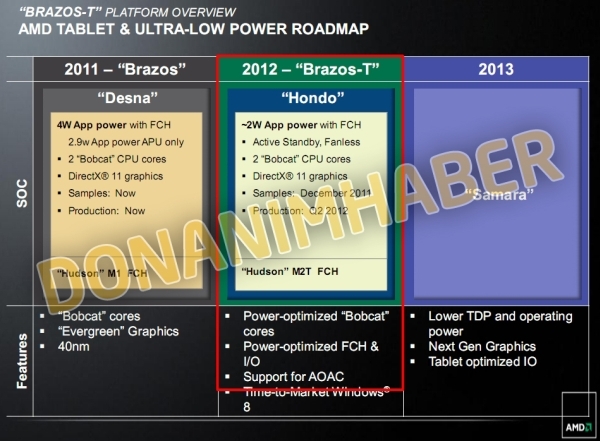 Among the other characteristics of the Hondo chipset include a lower “app power” of about 2 watts. The 40nm processor will also include Radeon HD 6250 graphics that will enable it to take care of 270p HD quality video playback as well as DirectX 11 graphics. The chip which can be considered a descendant of the new Desna APU has been designed for operation in fanless computers, thus making it ideal for operation in a tablet where it won’t generate much heat.